This raised bowl exhibits a chased swirling image of sea life, with waves, fish, seaweed, and other aquatic elements. The rim is encircled with a cast silver border imitating coral and applied shells, crabs, and seaweed. Similar ornamentation appears on the raised and soldered foot. Two large cast scallop shells, encrusted with cast seaweed, serve as handles. Traces of gilt can be found throughout the bowl’s surface. 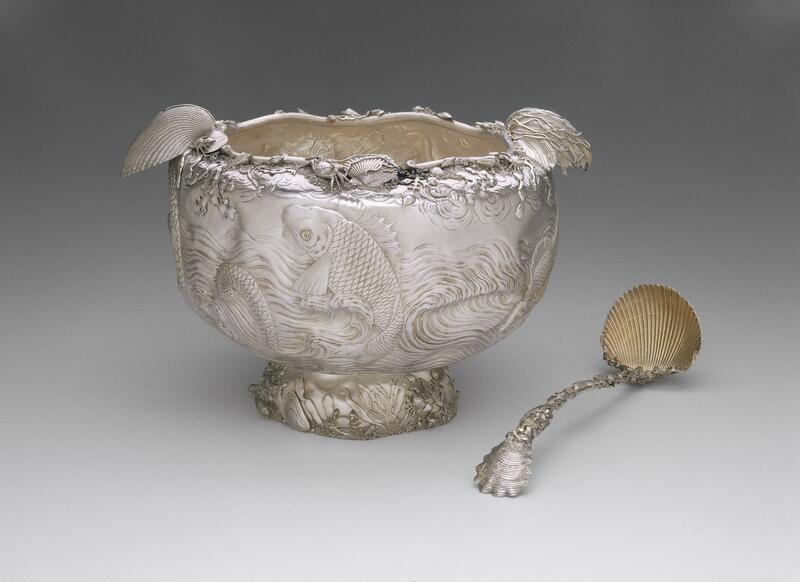 The ladle has gilt accents and is made up of cast elements: a scallop shell bowl, oyster shell terminus, and applied sea-life ornamentation on the handle. a testament to the extraordinary technical and artistic prowess of Gorham’s craftsmen in the late nineteenth century, an era otherwise noted for significant advances in machine production. Reflecting an interest in Japanese art and culture that predominated in the 1880s, this magnificent set demonstrates not only the influence of British reform, or craftsman, movement at century’s end but also America’s engagement with the Aesthetic style. This raised bowl represents a tremendous technical achievement, evidenced by its broadly repousséd ornament of swirling waves, flying fish, and fantastic sea serpent. 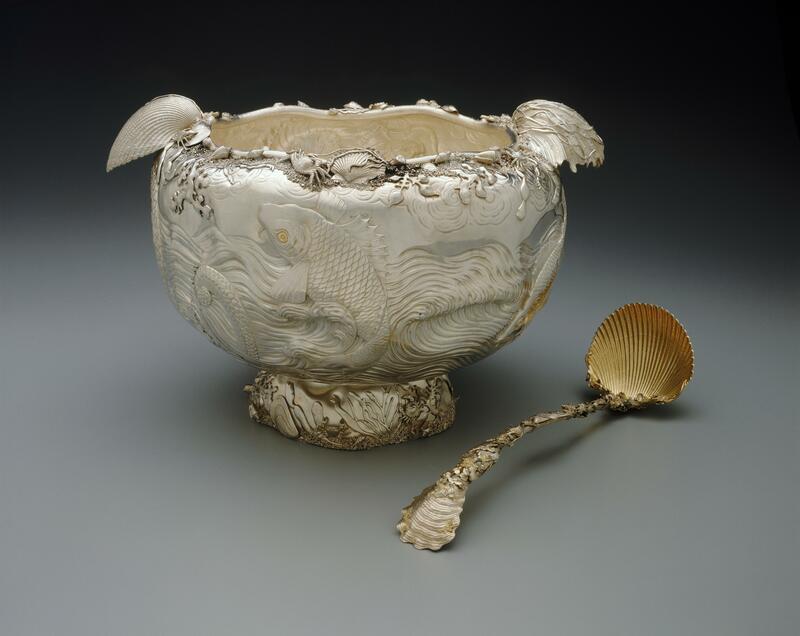 Surviving company records reveal that the retail cost was about $840, a considerable sum in 1885, and that the value of the gold on the piece far exceeded that used on other punch bowls created at the same time. The interior, as well as the serpent’s tongue and eyes and other details, were originally gilded. By 1980, with Firestone and Parsons, Inc., Boston, Massachusetts; 1980, purchased from Firestone and Parsons by the MFA (Accession date: November 12, 1980).